Ronny was diagnosed with Metastatic Neuroendocrine Cancer in July 2010 after presenting with weight loss, iron deficiency anaemia and facial flushing (Carcinoid Syndrome). Cancer isn’t always a one-time event. It can be a chronic (ongoing) illness, much like diabetes or heart disease. Cancer can be closely watched and treated, but sometimes it never completely goes away. The cancer may be 'controlled' with treatment, meaning it might seem to go away or stay the same, and it doesn’t grow or spread as long as you are getting appropriate treatment. Sometimes the treatment shrinks the cancer, but the cancer is still there – it doesn’t go away and stay away – it’s not cured. For the first 18 months following my diagnosis, I underwent a significant number of treatments and tests. As I go on living with my cancer, that tempo doesn’t seem to have gone away. Every 4-6 months (and sometimes in between too) I undergo a plethora of tests and appointments and I feel I'm stuck in this perpetual change – sometimes I'm not sure what to expect or what’s going to happen next! I guess that living with an incurable cancer is not so much about “getting back to normal” but rather what’s normal for me now. I suspect this is the case for many incurable Cancer patients. I saw a post on one of the forums last week - the question was "what does stable mean". The answer may seem obvious but one reputable website defines it as follows "A doctor may use the term controlled if tests or scans show that the cancer is not changing over time. Another way of defining control would be calling the disease stable". Worth noting that "not changing" can also mean 'not decreasing'. And so at yesterday's half yearly meeting with my Multidisciplinary Team (MDT), "stable" was once again the conclusion. I found myself agreeing on the basis there is no remnant tumour growth and my biochemistry results are unremarkable (don't you just love those medical terms?). Stable is my new normal! However ....... (there's always one of these with Neuroendocrine Cancer), I have two issues, one ongoing and one new which are potential bumps on the road ahead (at least the ones I can see). Thyroid lesion (ongoing). Although it has not grown since discovered, it was agreed a biopsy using Fine Needle Aspiration (FNA) would be conducted given my history. This has now been attempted three times and each time they were not able to produce a conclusive 'cytodiagnosis' due to insufficient numbers of cells. I'm now to be scheduled for a core biopsy, i.e. a thicker needle. Remember "No Fear". Likely outcome is benign - 95% chance. A potential issue with lower back and hips (new). I'm on long term blood thinners (Clexane) due to the discovery of blood clots in one of my lungs following major surgery in 2010. To keep an eye on the risk of developing osteoporosis arising from long term use of this drug, I have an annual DEXA scan which measures bone density. My recent scan has reported some weak areas but nothing too serious. Coincidentally I had been prescribed pain killers by my GP (PCP) only days before for pain in lower back, my left hip plus one of my wrists (too much blogging!). Lack of Vitamin D is also a risk factor due to surgery and malabsorption. I already know from annual vitamin blood tests that my Vitamin D level is 'insufficient'. As a first step in the investigation, an up to date blood test has been ordered plus an increase in my current D3 supplement dose. Thanks very much for this blog Ronny.a! It is featured as one of our top blogs this week! Click here to view the rest of our top content. 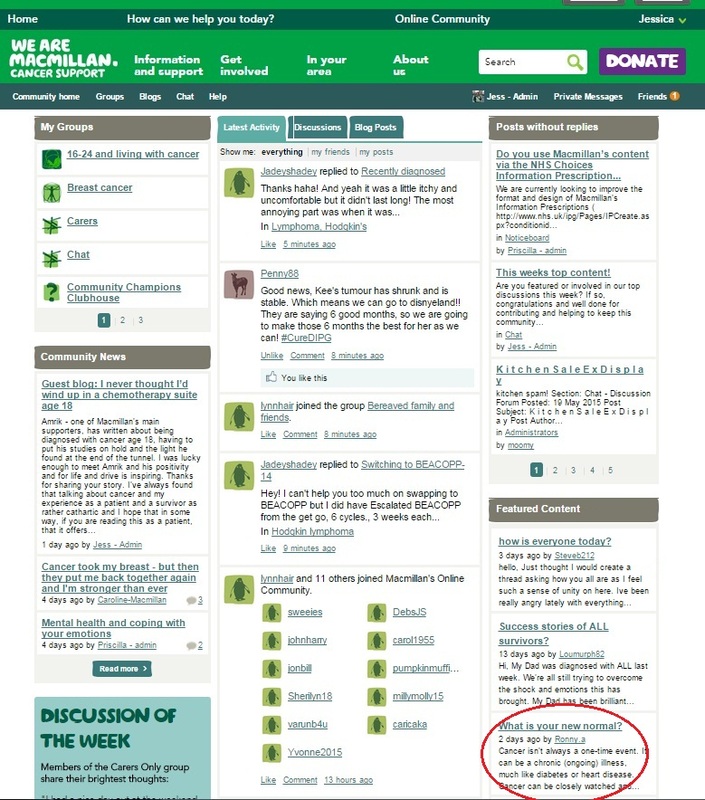 Great, I'd like to tweet this with the link directly to Macmillan. 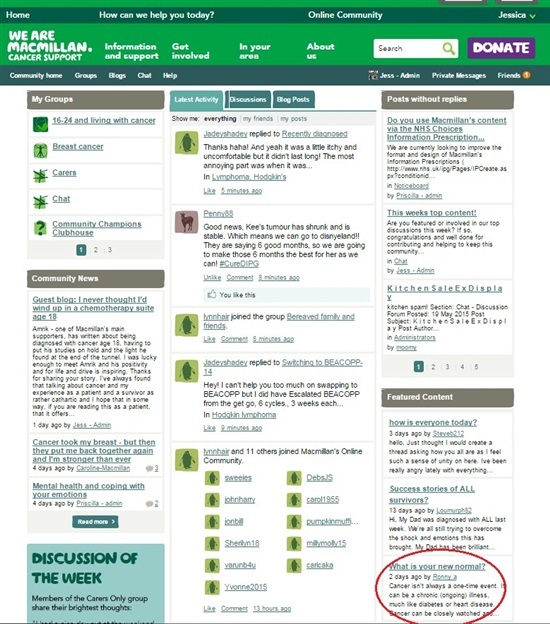 Is there a particular Macmillan twitter handle to copy in for a retweet? Jess - you are too kind! Tried but I guess they were busy doing the NPower LoL publicity. I did get approached if I wanted to attend that but in the end I wasn't called forward, perhaps you guys helped get my name on the list? Not sure. It is quite dificult to get a retweet from the big cancers! Just about to publish another blog where I mention the Macmillan toilet card scheme!